Few people can talk as authoritatively about “flexible workstyles” as Joel Ratekin, founder and president of Ratekin Consulting LLC. Over the years he has helped firms, large and small, transform their offices into “distributive workspaces” and adopt new ways of working that boost employee (on-site and virtual) productivity. But for many firms, the transition from a traditional to a flexible work environment isn’t easy. In this interview, Ratekin shares with IT Business senior online editor, Joaquim P. Menezes some of the main barriers to flexible workstyles and how they can be overcome. 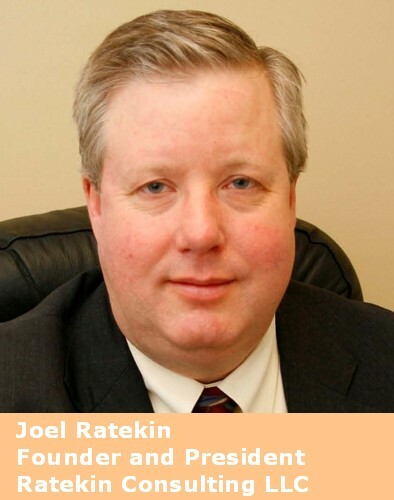 Joel what services does your firm, Ratekin Consulting, provide? I started my company in 2007 to help corporations deploy flexible work systems. We’ve worked with big firms – such as American Express and Capital One – as well as smaller ones. My experience was people were already working in flexible ways, but the corporation was often unable to understand the power of embracing new, flexible work programs or to implement them in a quick, effective manner. And what kinds of barriers do you see in companies to the adoption of flexible workstyles? The primary obstacle is management resistance. This often happens at two levels. Initially, senior management often don’t get it. There may be a senior executive who brings the idea forward and then funds a study to explore what it might be like. But getting C-Suite buy in and unanimous executive approval is often a roadblock. Fear of disruption to the business, or about not achieving the organization’s performance goals often cause the program to stall. And if you successfully navigate through that process and get senior-level advocacy, there’s a second hurdle to be crossed — middle management opposition. Helping middle managers accept and adjust to the way work gets done can be a challenge. Workers want this program. There’s a readiness at the worker level – regardless of age and regardless of gender – for increased personal flexibility and power. But middle management is most resistant at this point. I guess part of that resistance comes from the managers’ fear that reports would slack off, or won’t be accessible when needed. The perception that one can stroll down the hall and find the person you want to attend to an issue or get some task done immediately often doesn’t hold good today. It has to be replaced with performance-driven objectives. In any case, even with resident workers, the reality often is that a manager who walks to a report’s cubicle often finds the chair empty (because the person is at a meeting, on a break etc) and would need to write them a post it note, for instance, and stick it on their monitor. In the new environment, the manager could just log on to their IM app and find the person quickly. So yes, management resistance to work style change is a big hurdle to be overcome. There are four things to do to break down resistance and ensure the success of a new workstyles program. First off, when talking to middle level business managers, don’t present “flexible workstyles” as a real estate cost-savings or an HR benefits program. Position it as an initiative that enhances business processes, improves employee productivity, and the bottomline. Secondly, ensure there is a level of agreement between executives about the need for such a program. When a senior leader of the organization pushes for this repeatedly and has the support of others in the executive team, that’s a great indicator of success. Third, offer people the tools and training they need to adopt new ways of working, and have those tools available on the company Intranet for access any time, anywhere. Finally, have plenty of feedback mechanisms in place to get worker input on the program — why it’s working, what they’re afraid of and so on. That’s a great way to monitor progress and effectively deflect any problems as they arise. So in summary the steps are: ensure it’s a business led effort, ensure senior leaders jointly support it, and put great feedback mechanisms and training tools in place throughout the change process. In your experience, how open are companies to getting workers involved in choosing their own work style? The paradox of flexible work today is that the greater the ambiguity, the better the results. Let me explain. When I need some kind of real estate portfolio space reduction to maximize the program’s savings, I actually need to loosen up and provide choice, as widely as possible. My experience is if you’re rigid and say: this job function equals a resident assignment, this job requires field work or home work etc. – there’s huge resistance to change. On the other hand, if workers are offered a choice – when appropriate – the degree of mobility increases dramatically. In my experience, at least 60 per cent of the workforce chooses a mobile work style. And with that comes desk sharing. But clearly there are situations when a mobile work style isn’t suitable at all. That’s true. So I like giving the manager the authority to override the employee’s choice. For example, a poor or marginal performer in the office isn’t going to become a better employee by choosing a telework program. That’s not a good recipe. So giving a manager ultimate control is important, I believe. But there are some managers who because they aren’t comfortable with the program start vetoing more people’s choices far more than they should. And it gets to a point where all or most of that manger’s reports are resident. I’ve also seen a healthy amount of peer pressure being exercised when that happens. So a middle manager whose team is entirely resident may (say) need half of an entire floor to support the group, while similar managers in the same organization need just a quarter of the floor space or less. 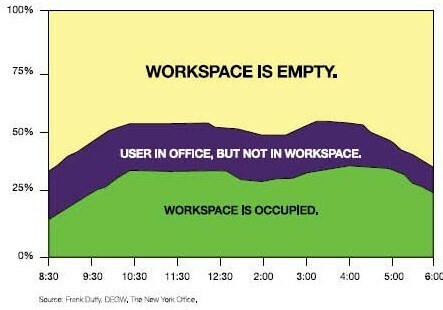 Suddenly people start questioning: Why do you need to have so much space for your team? Added to that, there’s the grumbling of employees who aren’t accommodated with their choice, and I’ve seen that too. It’s been my experience — 100 per cent of the time — that when managers do empower their staff with choice – employees never unselect mobility and go back to residency. There’s always an increase in workers who choose a mobile work style. And those who chose resident work out of fear, habit, or because they just want to hang on to their own desk – after seeing others work in a mobile way and learning to be managed by objectives – start becoming more comfortable with this. You’ve said earlier that resident workers are often not at their desk. How common is that? It’s very common. 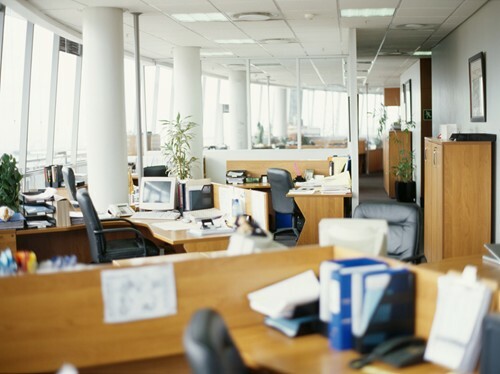 A scientific study of desk occupancy shows that self-described “resident workers” are often not in their chair more than 50 per cent of the time throughout the day. And that’s understandable. If you factor in the amount of time you’re in meetings, having a hallway conversation to help someone with something, going to the printer or mail room, attending a team meeting, visiting the restroom, or having lunch, or on break … the actual time at your desk could be 50 per cent or less. A study has shown that even with certain types of positions – such as call centres or admin assistants – people are away from their desk far more than you would expect. Apart from real estate savings, what are the other financial benefits to a flexible workstyles program? The way I’ve studied this is by asking: what are the barriers to work being done today? They could be technical issues – my password doesn’t work, my phone is out of order, you can’t find people, or can’t make a decision because you’re missing some vital information etc. When I evaluate barriers to work before and after the shift to a flexible workstyle, I find that after the change those barriers are reduced by around 20 per cent. When that’s linked to a dollar figure, the labour savings are tremendous. And this dollar value gets re-invested in the business.